What was planned as a routine congressional hearing on acquisition and property management at the General Services Administration on Thursday turned into the grilling of a freshly minted agency leadership team on the future of FBI headquarters. Both the chairman and ranking member of the House Oversight and Government Reform Operations Subcommittee scolded the GSA witnesses for this week’s abrupt change in Trump administration plans in favor of building a new headquarters on the downtown site of the current one. This change in plans would be made possible by shrinking the Washington-area workforce. The number of FBI employees needed at headquarters dropped from 10,600 to 8,300 in a new Trump plan to shift hundreds to other states. Under the new plan, the FBI would be one of the only members of the Intelligence Community that does not have a stand-alone campus “to mitigate both physical and espionage threats,” he added. Dan Mathews, commissioner of the Public Buildings Service, said his agency “stands by the decision” made by the FBI to change its requirements from a consolidated headquarters that houses 11,000 employees to the smaller staff, which rendered it feasible to rebuild on the existing site. Though he struggled to pinpoint the timeline of events, Mathews said, “It’s important to understand that it began with the [July] cancelation of the previous project” that involved bids from competing developers who would exchange construction of the new campus for ownership of the Hoover site. The canceled procurement was due to “insufficient funds” from Congress before he arrived in his job, said Mathews, a former Capitol Hill staffer who acknowledged that he had long followed the issue. “The issue at hand was signing a contract without funds in hand,” he said. “New construction allows us to meet national security requirements” such as setbacks for protection against bombings, electronic eavesdropping and chemical and biological threats, he said. Upon questioning on the number of other GSA-controlled sites that might be available, he put the number at 32. But Meadows scoffed. “This is not my first rodeo, or my first hearing on surplus property, and I can I guarantee you it’s more than 32,” the chairman said. 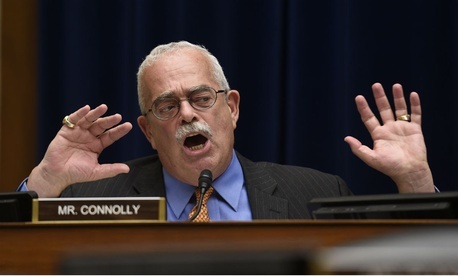 Connolly called GSA’s explanation “Kafkaesque,” saying it “will expose the FBI to real danger.” For six years, the FBI has been saying it needed to “consolidate because fragmentation hampers information sharing and collaboration” in the face of such threats as terrorism, Russian interference in U.S. elections and cyberattacks. “Now you’re saying they changed their mind?” he asked. Connolly also challenged the PBS chief’s statement that Congress hadn’t come up with an appropriation, citing a promise elicited by then-Sen. Barbara Mikulski, D-Md., and noting that Trump’s GSA still wants $2.2 billion for the downtown plan. GSA Inspector General Carol Fortine Ochoa, while citing the need for reducing waste and improving procurement integrity, warned of a coming retirement wave “in mission critical staff” that will reduce expertise in all GSA divisions. Alan Thomas, commissioner of the Federal Acquisition Service, spoke of coming savings through consolidating fleet management. GSA now manages just one-third of its fleet, or 200,000 vehicles, Thomas said. He estimated the agency could save $2,500 per vehicle on average through consolidated management by GSA rather than other agencies.